This family-owned coffee shop has been in business since the 1970s and its success hasn’t come through sheer luck. With a 100 year old roaster in the front window, you can smell the roasted beans. 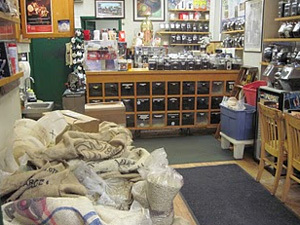 They sell coffee and tea varieties from more than 65 countries, including Rwanda and the Galapagos. They have succeeded by being passionate about coffee. If you are looking for a selection of coffee you can brew yourself, look no further than Coffee & Tea Ltd. in SW Minneapolis. If you are searching for an example of creating a remarkable small business niche, look no further than Fluffy’s litter box. If you are really having a tough morning, maybe you should pour yourself a cup of Kopi Luwak. It’s made from red beans that have been eaten and pooped out by the Civet Cat from Indonesia. And while you might have to pay me to drink this stuff, Edina housewives are shelling out $420 per pound for this stuff at Coffee & Tea Ltd. This entry was posted in Marketing & Advertising, Minnesota, Weird News Crazy Videos and Conspiracy and tagged Cat Poop Coffee, Civet Cat, Coffee & Tea Limited, Coffee & Tea Ltd., Coffee shop marketing, Kopi Luwak, Minnesota. Bookmark the permalink. Can you say viral marketing? The Kopi Lewak story was covered by Southwest Journal and that was picked up by local news feeds and radio. KSTP came and shot a segment that was aired on the Twin Cities Television News. ABC “Money Matters” interviewed Jim Cone, our Roastmaster, for national broadcast television! We have had radio stations call in for interesting interviews and experienced a huge spike to website visits. There are links at the top of our home page for all of the print and video coverage that was received. Our web statistics show visitors from all over the world! There are so many other varieties of coffee and tea, if the Kopi Lewak is not for you. We have true gourmet coffee with staff that sincerely enjoy and know their product! Please, try coffeeandtealtd.com one time and we are confident that you will try us again.